Check out my new resources page, where I plan on maintaining a list of useful resources for a professional or aspiring security architect. It is a work in progress, so don't shoot it down just yet. As a rule though, I will be updating it with new things on a regular basis. New year, new resolutions, old habits? Sigh. So I know I have made promises before, but this time its a new years resolution(if that means anything). Yes, I plan to be posting more frequently. I have already scheduled deadlines in my calendar, so that should help me keep on track. In addition to the reminders, I have also put together a plan for at least eight posts. So before I get carried away with my new commitments, I think I should mention a few things about the passing of 2013. 2013 turned out to be a fantastic year for me, in pretty much every way. A new work opportunity came up which I was not going to let slip past. I attended a day of the ITweb security summit, where it was great to see some really high quality presentations from international speakers. I hope to go this year too, budget willing. I also attended my third ZACon, which is always an awesome con to attend. It started off with an evening of soldering my own Con badge, and then the next day was a tight schedule of presentations. The organisers always put together a good programme, with a mixed batch of presentations from all forms of hacking. I was particularly interested in the presentations about markov chains in hash cracking, mains signalling, mobile advert framework (in)security, and directional antenna design. 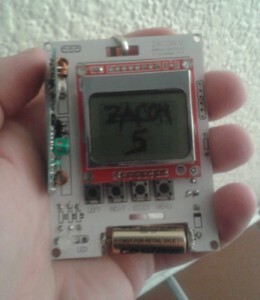 ZACon V "build a badge"
So enough about the past. What will I not post on my blog in 2014? I had a few technical articles that I wanted to post last year, but never got around to it. I still plan on putting them together, but for starters I am going to run with a series of posts about some interesting websites/webservices that can be used in the security space. My plan is to select a few good services, and blog about them; so that they can all be found from the same place. Personally, I tend to find cool stuff and then forget about them. So I am hoping that my posts will serve as store for both me, and anyone else interested. My, it has been a long time since I posted last. So to full you in quick, I contributed to the book mentioned in my last post, and have received my signed copy with my name printed in the contributions. I hope I will be contributing to more books in the future. So a lot has happened to me over the last few months. Most notably the beginning of my career in the information security industry. I anticipate that I will be making more frequent posts on my blog, and I already have a few topics lined up. So keep checking back! I promise the topics are interesting and worth a read. So I have been lax in my posts lately, but this has been because I have been preparing for exams(Which I am now writing). But be assured that as soon as exams are done, the posts shall commence.